The last movie to win Oscar Best Picture in Black ‘n’ White was this movie. Of course, it was before Schindler’s list (1993). 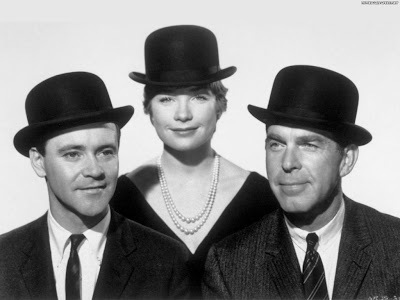 The Apartment made in 1960 was classic with reputed performers like Jack Lemmon (I cant stop ravishing about him), Shirley Maclaine aptly directed by Billy Wilder. This was a follow up from his previous smash hit comedy ‘Some Like it Hot’. I was in tears, because I was touched by the simplicity in which Jack Lemmon suppresses his feelings. The feelings when his boss played by Fred McMurray out of his marriage has an affair with Shirley Maclaine and he can just stand and do nothing about it. It is the apartment, which is in demand for few employees working at an insurance company in New York. 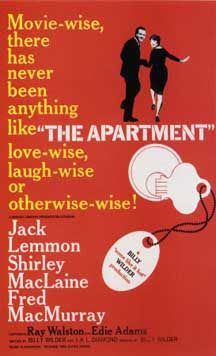 The Apartment belongs to Mr. C.C Baxter played by Jack Lemmon. To climb up the corporate ladder, he lends his apartment to his fellow selected higher officials to spend time with their muses outside house. The four managers keep their promise by spending positive appraisals to the personnel director, Mr. Sheldrake played by Fred McMurray. C.C Baxter is attracted to the elevator operator Miss Fran Kubelik played by Shirley Maclaine. It turns out, Mr. Sheldrake had sights on Miss Kubelik and they were involved in a relationship, which ceases to have an identity. In adverse circumstances, Miss Kubelik cannot tolerate the mystery of their relationship contemplates suicide and consumes sleeping pills at the Apartment. C.C Baxter to his shock finds Miss Kubelik in a state of horror. Next few days, he consoles Miss Kubelik and even tries to bring a smile. While his heroics of saving Mr. Sheldrake gave him a chance to become Asst. director. He always dreamt of this position, now he stalls himself to enjoy the newfound position. Jack Lemmon puts a remarkable performance. Shirley Maclaine looks cute in her hairstyle. Fast forward 37 years, Bollywood had its own movie in Yes Boss loosely inspired by the theme where Shahrukh Khan helping his boss Aditya Pancholi to get Juhi Chawla in return for a better corporate future. And in 2006, another Bollywood movie ‘Life in a Metro’ finds a sub-plot similar to the screenplay of ‘The Apartment’. Sharman Joshi does justice to his role similar to Jack Lemmon while Kangana Ranaut and Kay Kay Menon plays Shirley Maclaine and Fred McMurray to perfection. However, according to director Billy Wilder, The Apartment was inspired when he had seen the movie ‘Brief encounter’ in 1945. I quite like the ending scene…. Its about time when C.C Baxter and Miss Kubelik about to start a game of cards…. C.C. Baxter: You hear what I said, Miss Kubelik? I absolutely adore you. Fran Kubelik: Shut up and deal.